mirAsol Towable; Look toward the sun, feel the warmth and experience sustainable, green living in 185 square feet of delightfulness. Sip wine on your deck under the tree, on the lower pond, in the Meadows, at The Village at Flat Rock, NC. mirAsol meaning look toward the sun, and in Filipino it means Sunflower. 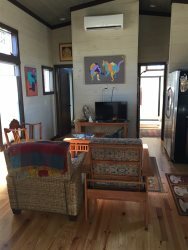 If you have seen HGTV on Tiny Towable Living and want to experience it, or if you are thinking of simplifying your own life, maybe even making a move into one, The Village at Flat Rock, NC is a community of like minded owners and guests, to connect, de-stress, and enjoy nature and green living. Make your plans to stay here for 2 nights, 2 weeks, or 2 months! You will have a hard time leaving. In a little town on the eastern end of Long Island, NY, I spent 35 years teaching young children about sustainability. "reduce-reuse-repurpose-recycle". We were going green one cloth napkin at a time, reusing lunch containers, leaving behind plastic and paper goods for real china, glasses, cloth napkins, and eating utensils. At our school we composted cafeteria scraps, maintained an organic garden, recycled cans and bottles, helped the town ban plastic bags, and shared our used clothing. In the midst of the mansions and big cars, I preached that bigger does NOT always mean better, that less is sometimes MORE, and...that the goal might be...a tiny house on wheels.Then, I retired and decided to live my words. I purchased mirAsoLtowable with the hope of educating folks to the possibility of living BIG by living small, of giving others the opportunity to venture into sustainable living. My objective--going green--one guest, one tiny house adventurer, at a time.Enjoy your stay at mirASoltowable, my tiny house dream come true--the dream I hope to share with you. I enjoyed staying in the tiny house community and being able to gage whether or not I'd want to move here one day. They have permanent residents, towable homes, and also lots they rent out. I checked in at the community center when I arrived, which you don't have to do, and the people I met were very helpful and friendly. I also met one of the residents living in a towable when I was walking my dog and talked to her one day. It's a close distance to Hendersonville, about 13 minutes away and 30 minutes to downtown Asheville. Overall a great area and perfect for renting if you want to try out tiny living. Make sure to follow their rules as if you were a resident though. No WIFI , FREE WIFI at Clubhouse. Attached Wooden Deck with comfortable wrap around bench setting. Deck overlooks the pond and is under a beautiful shade tree. Convenient ramp, instead of steps, to deck and tiny house entrance. Dog Bowl for your small dog. Comfortable, Cozy, Queen bed in loft,with 2 lights for night time reading. *This Tiny House is best for 2, possibly 3 people. and 1 dog, no cats, - not allowed on any furniture or loft. * most are welcome, some kinds are not so please ask us. Plenty of sheets, pillow cases, throws, pillows and all linens provided for your comfort. *Note: the table along the wall is expandable and the little wooden table can be expanded too, for meal times and game times indoors or on the deck. Welcome Book to leave your experience for the owner and other guests to read and learn about your THOW stay and what Green Ways you may have learned while staying here - please share with others. Club House also has FREE Internet for guest to use. This was a comfortable and cozy home. Location was perfect. It became one of the most memorable vacation in our life. It is not only because the place was beautiful and relaxing, but it also changed the way we think about owning things. We are Japanese and we are used to living in small houses, Staying in your tiny house with minimum items was very inspiring. It made me realize many of the things we own are not necessary. *Please note: If you bring your 1 dog, no cats, please do not allow on furniture or up in the loft. Owner provides a nice dog bowl for your dog :) * Up to 80#, some kinds not welcome please ask. *NO cats allowed. Owner is highly allergic!